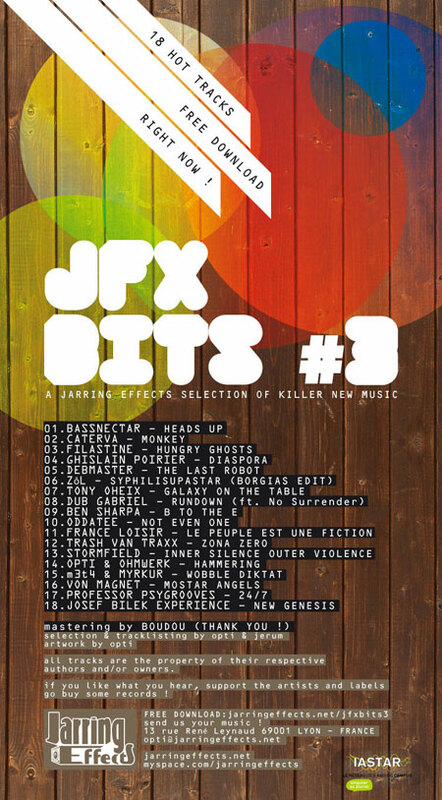 Jerome of the French label Jarring Effects contacted me yesterday about their free compilation JFX Bits #3. Lots of nice dubstep, hip hop and other kinds of tracks on this release with Bassnectar – Heads Up, Filastine – Hungry Ghosts and Ghislain Poirier – Diaspora as my favorites. thanks a lot thomas…downloading it……..
yeah i really liked the track run down by dub gabriel. thats sick and also the final two tracks which are different from the whole bunch, kinda nu jazz, just great.